Residents of the Lyric 440 K Apartments in Mount Vernon Triangle can add an on-site bakery/coffeehouse to their amenity list with the signing of a retail lease with the owners of Baked & Wired, the iconic coffee shop and bakery in Georgetown. Lyric 440K owners/developers Quadrangle Development Corporation and The Wilkes Company announced the 4,231 square foot lease today, as the new apartment community surpassed the 70% leased mark. Residents of the Lyric 440 K Apartments in Mount Vernon Triangle can add an on-site bakery/coffeehouse to their amenity list with the signing of a retail lease with the owners of Baked & Wired, the iconic coffee shop and bakery in Georgetown. Owners/developers Quadrangle Development Corporation and The Wilkes Company announced the 4,231 square foot lease today, as the new apartment community surpassed the 70% leased mark. The new concept – to be named later this year - will be a sister store to Baked & Wired and will offer handcrafted breads using slow fermentation and traditional baking methods along with hand crafted coffees from a custom Slayer espresso machine using multiple small roasters. The shop will offer a light fare menu that encourages pairings of breads with house-made spreads and toppings. Baked & Wired pastry fans need not worry – the new store plans to provide an assortment of retail offerings and sweets to complement the menu and Baked & Wired customers will be able to pick up special orders at the Lyric 440K location. The new store will have café seating and a welcoming, community atmosphere. “We want this new concept coffeehouse to be a comfortable gathering space for residents of Lyric 440K and people from all walks of life – from residents and office workers to tourists, students and sports fans headed to nearby venues,” said Baked & Wired owner Tony Velazquez. The new store is scheduled to open in early 2015. Lyric 440K is a 234-unit, 14-floor luxury residential building, and the Quadrangle/Wilkes team’s fourth building in their two million square foot mixed-use community in Mount Vernon Triangle. Lyric 440K offers a mix of one-bedroom, one-bedroom with den, and two-bedroom apartments along with resort-inspired amenities and the highest levels of resident services. Leasing information on Lyric 440K is available at http://www.lyric440.com. Located in the heart of the nation’s capital and steps from Metrorail, bus routes and parks, Mount Vernon Place is the spectacular new mixed-use community under development by Quadrangle Development Corporation and The Wilkes Company. When complete, Mount Vernon Place will comprise ten buildings with approximately one million square feet of office and retail space and 1,200 apartments. Master-planned by the renowned architecture firm Hartman-Cox Associates, together with leading landscape architect Sasaki Associates, Mount Vernon Place includes four office buildings offering pre-lease and ownership opportunities in buildings ranging in size from 125,000 to 275,000 square feet and six residential buildings, all located along K Street, Massachusetts Avenue and Third and Fourth Streets, NW. The master plan also includes public art, cafés and finely detailed streetscapes. Mount Vernon Place is developed in its entirety by a partnership between Quadrangle Development Corporation and The Wilkes Company, both long-established and highly successful Washington-based companies. 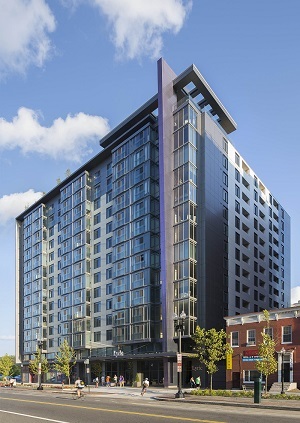 As one of Washington, DC's leading apartment, office, and hotel developers and owners, Quadrangle brings more than 40 years of experience to Mount Vernon Place and Lyric 440K. Quadrangle’s 25 million square feet of projects include urban and suburban office buildings, hotels and resorts, apartment communities, and mixed-use retail/office/living environments. The company is noted for its outstanding reputation, the high quality of its buildings, which have garnered many awards, as well as its long-term ownership and investment philosophy. For more information, please visit http://www.quadrangledevcorp.com. Established in 1980, The Wilkes Company specializes in transit-oriented, mixed-use development. The company has also completed and owns several million square feet of adaptive use, historic preservation, industrial, and retail projects throughout the Washington, DC area. For more information, please visit http://www.thewilkescompany.com.